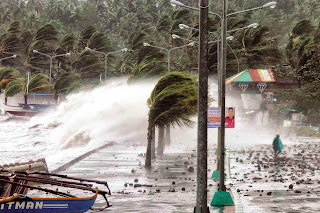 Home » Blogging » Climate Change » Filipino » Knowledge » Kwentong Pinoy » People and History » Philippines » Science » Weather and Climate » A Counter Attack Against Super Typhoons; Why Ruby Left Fewer Fatality Versus Yolanda? A Counter Attack Against Super Typhoons; Why Ruby Left Fewer Fatality Versus Yolanda? Instead fleeing for their lives many locals in Tacloban stayed in their homes when Yolanda hit only to be swept away by raging waters coming in from the sea. Now over a year, after experts bring good news—"there won't be another storm surge of that magnitude in the near future". Like other survivors, people had no idea what hit the city, November 8, 2013. Typhoon Yolanda squandered storm surges at highest as 17 feet and left scores of dead people. What is a Storm Surge? Before that fateful day, not a lot of people understood that a storm surge is an abnormal rising levels of the bodies of water as caused by extreme weather disturbance. It is the main threat to life and property during strong storms and causes massive flooding to communities. Japan International Cooperation Agency believe that the Philippines will not going to experience another storm surge of catastrophic magnitude like that on Tacloban at least not in the next 50 years. This hypothesis comes from the fact that the storm surge brought about by Typhoon Isewan (Vera) in Japan, the deadliest typhoon to ever hit their country back in 1959 has not been experienced since. However, Dr. Vicente Malano of PAGASA tend to disagree with Japan's hypothesis. For one big reason, 'all storms generate storm surge as simple as that.' Maybe not the same magnitude but for Philippines, as way of unpredictable weather disturbances similar things might come up the next time. Which his expectation cope with Super Typhoon Ruby (Hagupit) as it hit the Philippines this year. Compared to Yolanda, fatality of Typhoon Ruby is much fewer that the previous super typhoon. PAGASA also warned us that there are still or might other typhoons to come as yearending approaches. If only people were aware about storm surge, who knows? With proper preparation and right information we could have made the difference between life and death. Tell us your comment below and don't forget to add us on your Facebook. We would like to show our commendation to the valiant efforts of the government officials and non-government organizations who personally went to the places affected by Typhoon Ruby. More importantly for settlers that evacuated earlier before that super typhoon hit the country. Now, we know the right strategy overcoming the situation. Keep it up! Michael Gierza loves to create Science Investigative Reports. He also writes different topics and manages Kwentology. Thank you for reading A Counter Attack Against Super Typhoons; Why Ruby Left Fewer Fatality Versus Yolanda? posted on the website Kwentology if you want to redistribute this article please include the link as the source. Have some kuwento to share? Contact us!